What is possibly the first ‘epetition’ to be submitted to North Kesteven District Council has reached its target of 300 signatures in order to be heard by councillors. The petition against the authority revamping its corporate logo at an estimated, and disputed, cost of up to £5,000 was set up by Coun Mark Suffield, NKDC member for the Sleaford Quarrington and Mareham Ward. He took the action after being unhappy about the council voting by a majority decision on April 26 to change the design to make it easier to reproduce, more up to date and distinctively visible alongside other brands when campaiging to draw investment to the district. His petition called on the council to scrap the ‘unnecessary rebranding of North Kesteven District Council’ as he felt it was a waste of council funds. The logo would change to a green and orange ‘flourish’, drawn up by the council’s in-house designer. Councillors had been told rebranding would be phased in as equipment and resources were replaced to save money. The online petition runs until June 12 and had to reach the required 300 signatures in order to be considered by council. It has hit that target with 19 days to spare. He hoped to see residents against the new logo attending the council meeting to show the depth of feeling. He had added the previous day on his Twitter feed that he had allegedly been asked to remove the current NKDC logo from the Campaign to save it to ensure it does not look as if the council are endorsing his ePetition. For a joke, his young daughter drew her impression instead. 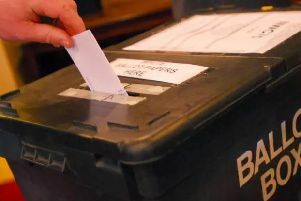 Chief Executive of North Kesteven District Council, Ian Fytche, said it would come to council for consideration on July 12 if it met the necessary threshold of signatories. He added: “The Council voted by a two-thirds majority to approve a strategy that included a refresh of the corporate logo and activity to deliver on that is underway in accordance with that expressed will.